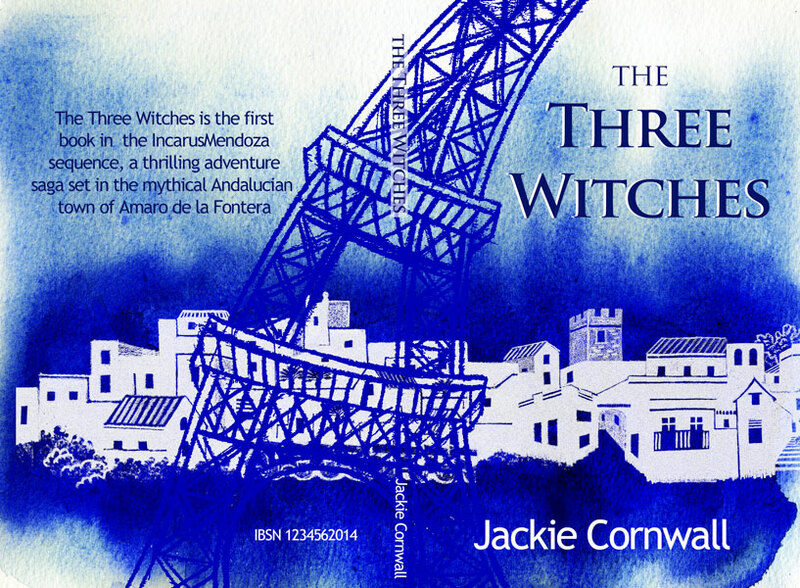 Last summer Jackie Cornwall commissioned me to design the cover for her latest novel ‘The Three Witches‘. 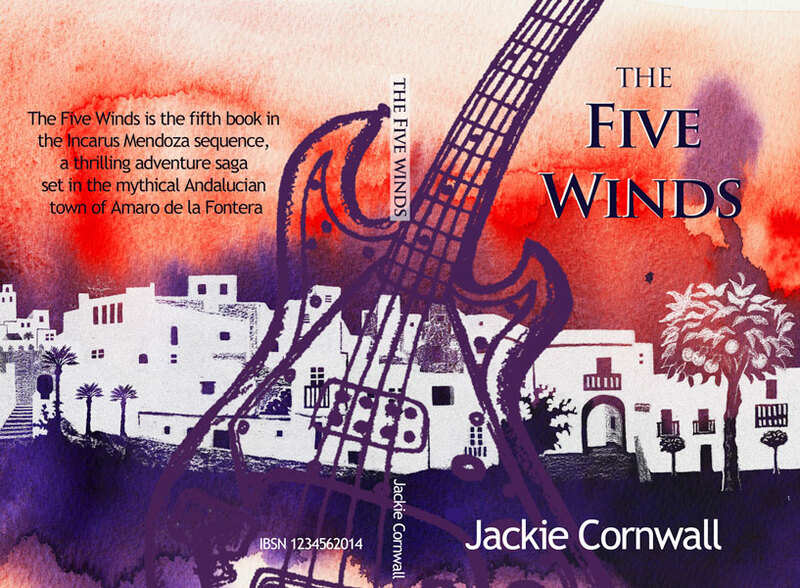 It’s the first in a series of six books that will make up ‘The Icarus Mendoza Sequence’, a thrilling adventure story spanning three decades of the life of the gifted and troubled Icarus Mendoza. 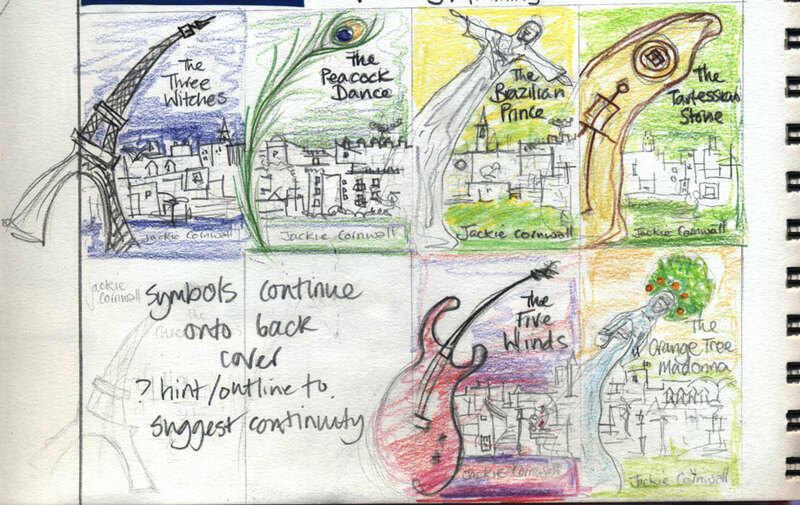 Jackie told me the outline of the entire sequence, emphazising the themes for each book and the colours she associated with them. 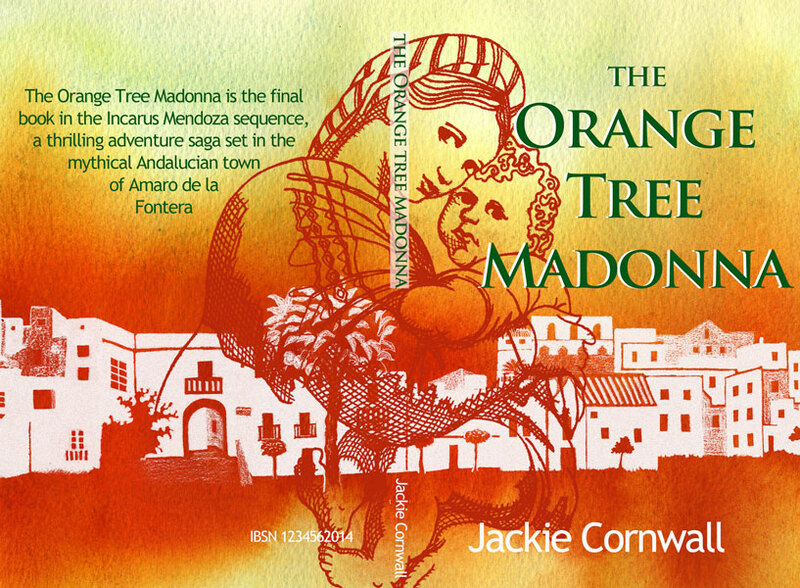 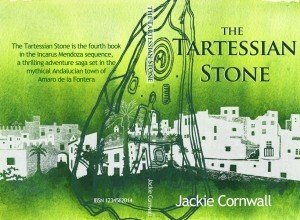 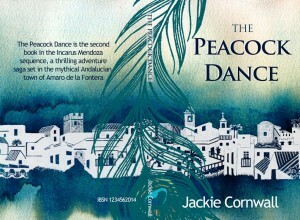 The backdrop to all the books would be the fictional town of San Amaro de la Frontera, which Jackie based on Vejer de la Frontera the beautiful Andalusian pueblo blanco (white village) where we live. 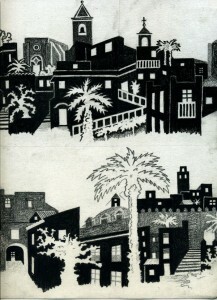 Almost immediately it struck me that the six book covers could feature a continuous townscape, representing constancy and refuge, and that the section of townscape depicted on the front cover of the first book could appear on the back cover of the second book and so on for the entire sequence to make an interlocking set. 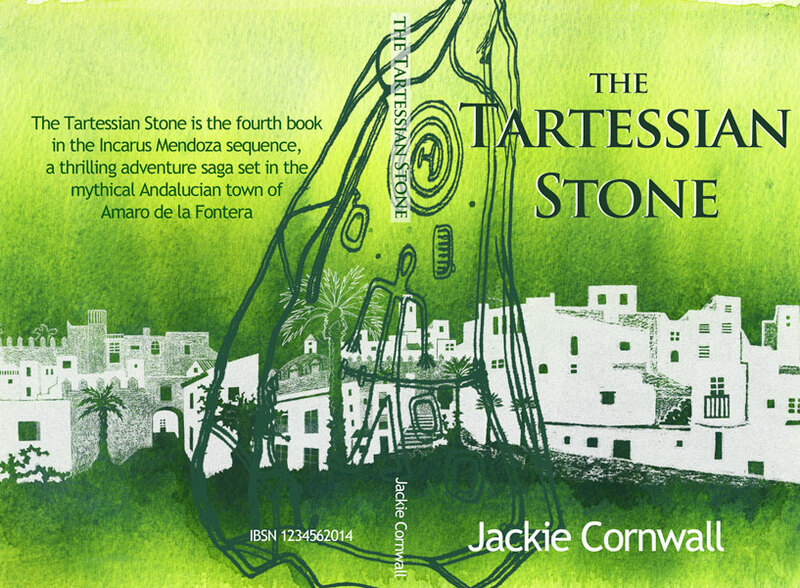 A symbol representing the specific adventure theme for each book could then be superimposed over the townscape. 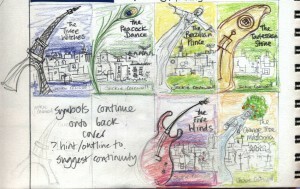 I sketched the symbols ‘looming’ to liven up the composition and give them a threatening feeling. 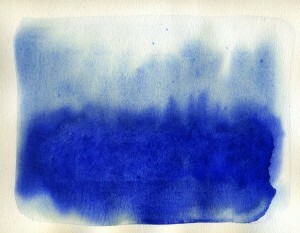 Working from photos I’d taken of Vejer I sketched a montage of views. This turned out to be very labour intensive, I had to draw, scan, invert and splice two extra sections of town before I had an image long enough to cover the estimated length of all six covers. 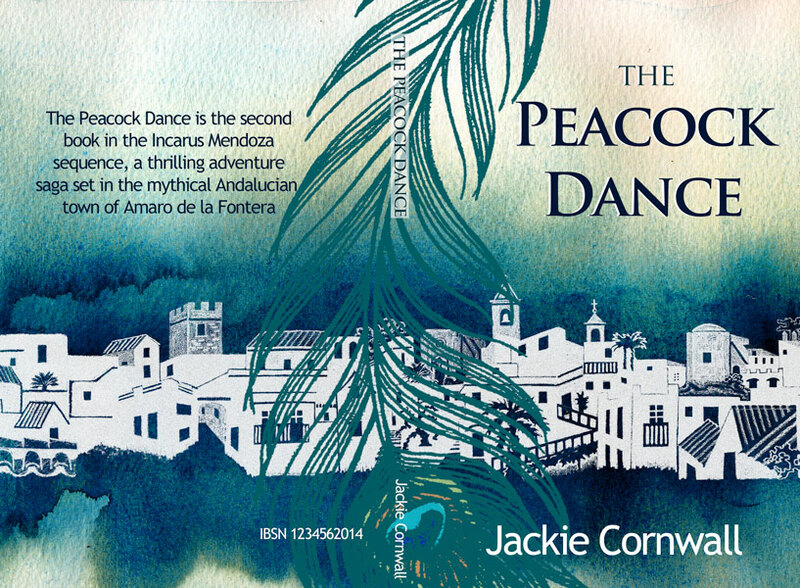 I wanted to create richly coloured backgrounds with interesting textures so I opted for watercolour paint, using the wet on wet technique on heavy weight paper with a rough grain, referring to the notes I’d made on Jackie’s colour preferences for each book. 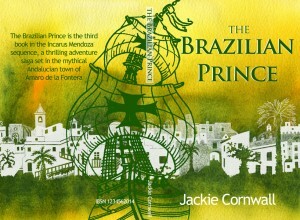 At this point Jackie clarified which symbols she thought were apt for each book and offered suggestions to replace those which weren’t. I drew each symbol in pencil and scanned it into Photoshop. 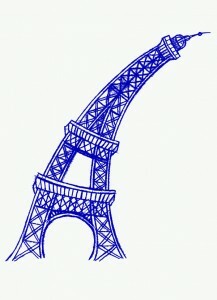 Finally I added the text. 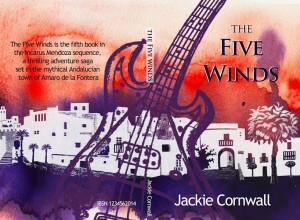 And here’s the interlocking set of six again, you can click on it to make it larger. 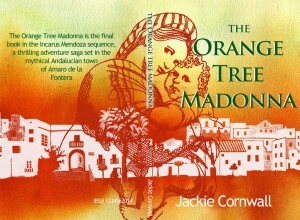 It’s available to purchase now on Amazon.